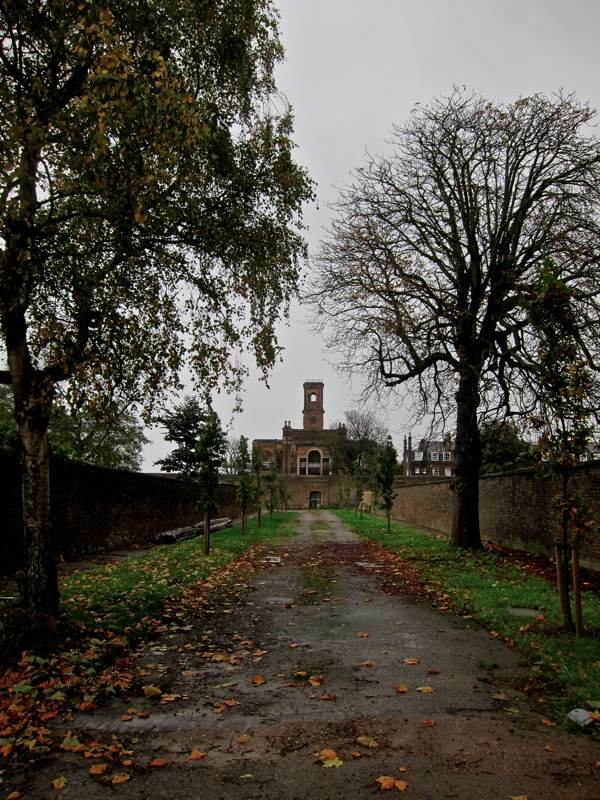 On a drizzly afternoon in autumn, it could easily have been a melancholy experience to visit the derelict church and old terraces that comprise the last fragments of the Georgian dockyard at Sheerness, if it were not for the fact that they are currently under restoration thanks to the bold initiative of the Spitalfields Historic Buildings Trust. 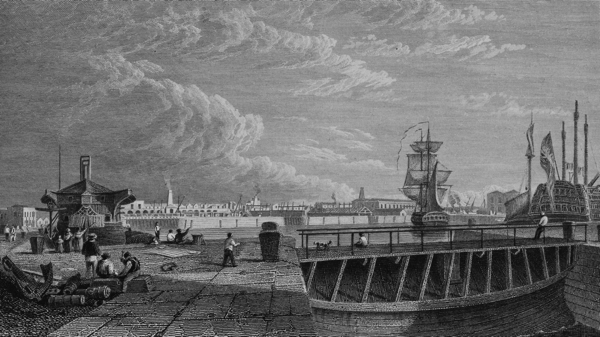 Following the Napoleonic wars, Sheerness Dockyard was built to a grand triangular masterplan by the great engineer John Rennie the Elder in the eighteen-twenties. 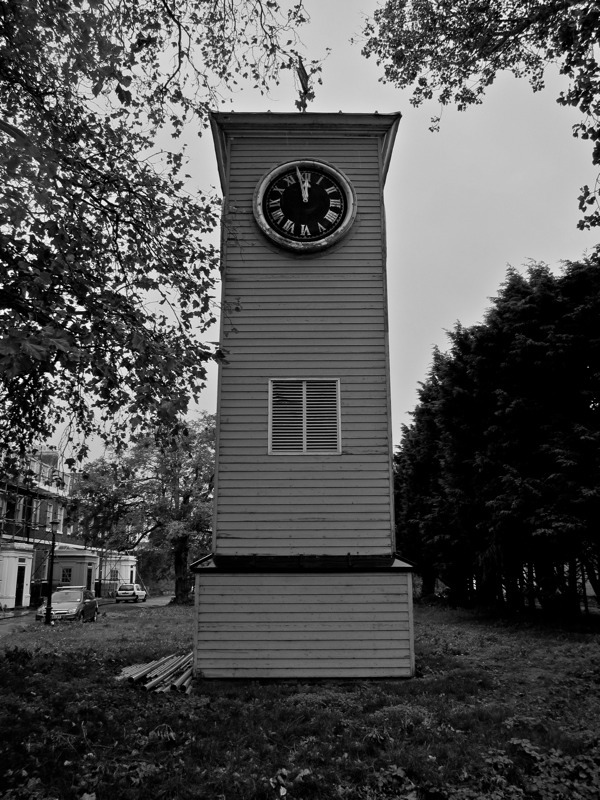 Completed in 1830, it remained in use by the Royal Navy until 1960 when it was turned over to commercial use with the loss of thousands of jobs, devastating the local community and wiping out part of the town. 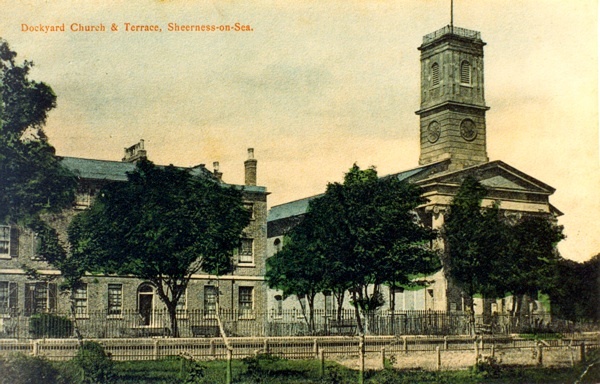 Today, Sheerness is the country’s largest port for motor imports and very little of Rennie’s dockyard survives apart from the residential quarter. 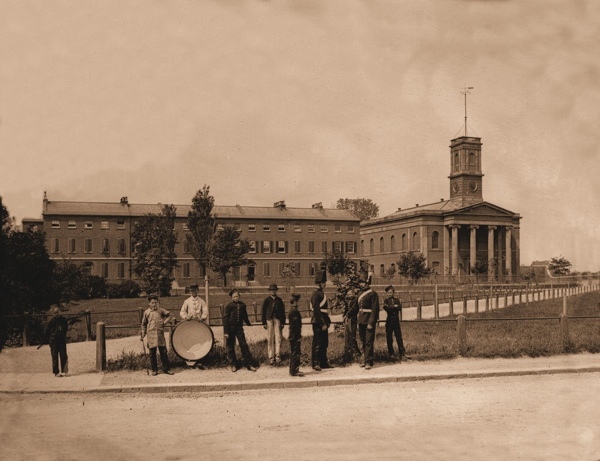 Only a scale model of 1820 exists as testimony to the former realisation of Rennie’s vision. 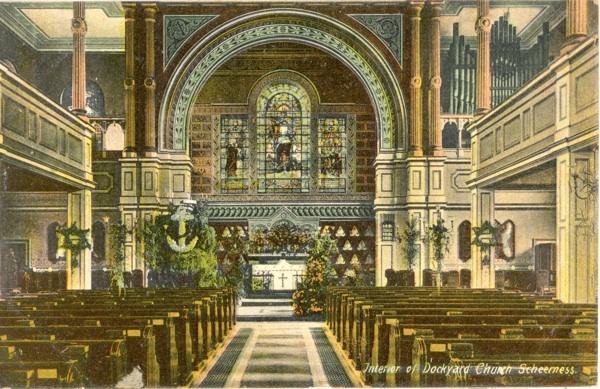 Sold off to developers at the end of the last century, the terraces were left to decay and the church was burnt out in 2001. But, when plans to build blocks of flats collapsed in 2010, the Spitalfields Trust was able to step in and buy the four acre site with the assistance of a loan from the Architectural Heritage Fund and a handful of brave investors who took on individual properties. 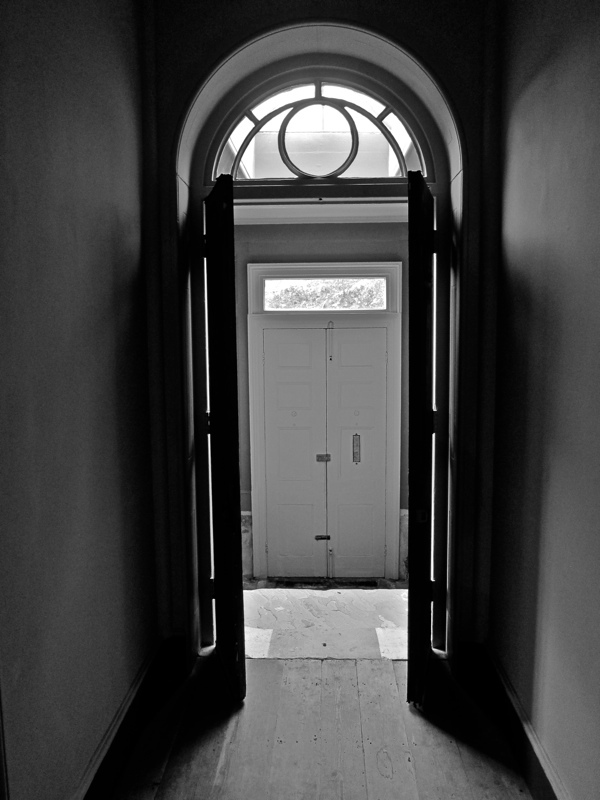 Since then, the fine houses which – apart from one original resident – were empty for decades, have been repaired by their new owners, removing the accretions of the twentieth century and restoring the landscaping of the original design. 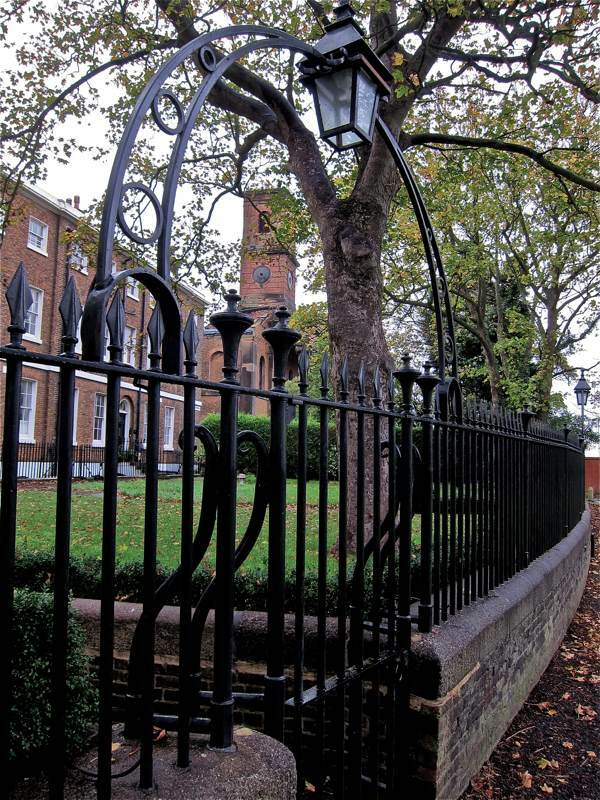 Edward Holl and his successor George Ledwell Taylor were the architects responsible for executing Rennie’s designs, and the terraces at Sheerness have a familiar quality as if they had been transplanted from Canonbury or Camden Town. The proximity of the container port with its great cranes looming enforces this sense of surrealism yet, unexpectedly, the utilitarian designs of different centuries sit side-by-side in unlikely harmony. 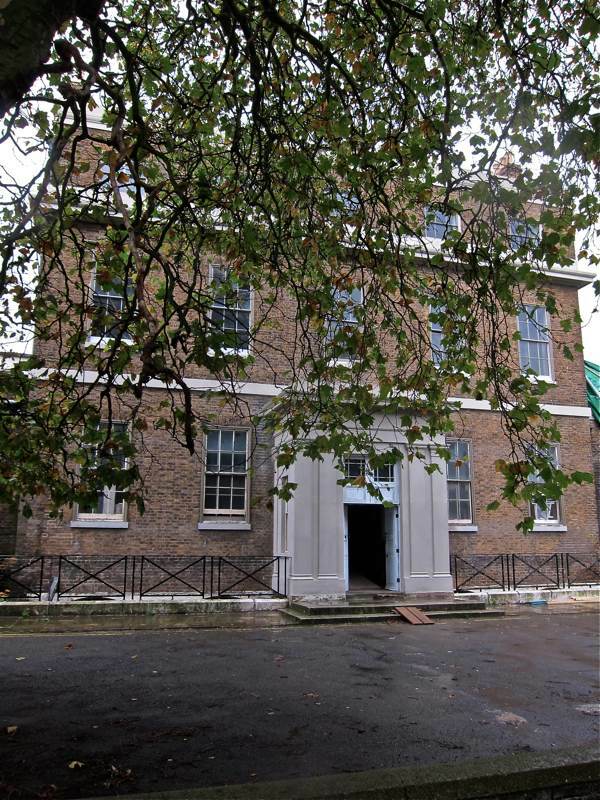 Built to house the principal officers of the dockyard and their families, these buildings are characterised by an austere elegance and graceful proportion, with subtle distinctions of social hierarchy reflected in their construction. This is undemonstrative architecture and, upon entering, you are aware of generous spaces with plenty of light, use of quality materials and considered detailing throughout. 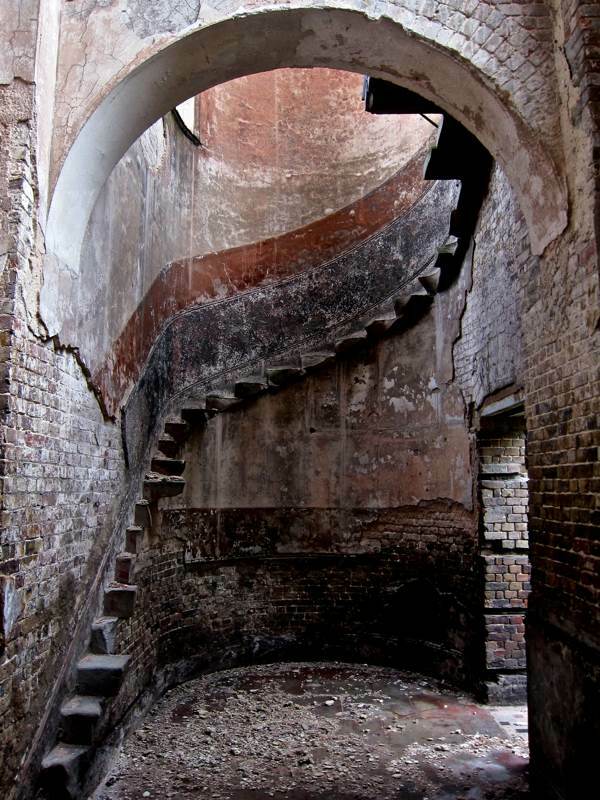 While the restoration and repair of these houses is in an advanced state with many new occupants in residence, the shell of George Ledwell Taylor’s Dockyard Church presents the next challenge. 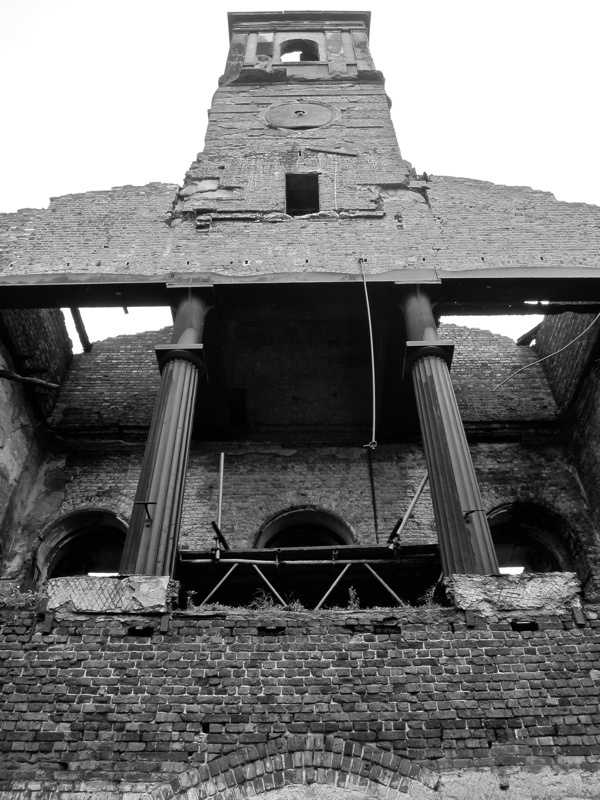 Dramatically combining iron and brick and possessing an impressive portico, it is a magnificent ruin at present, but the Trust intends to restore it as a community centre with spaces for small businesses to operate and as a home for the dockyard model of 1820. 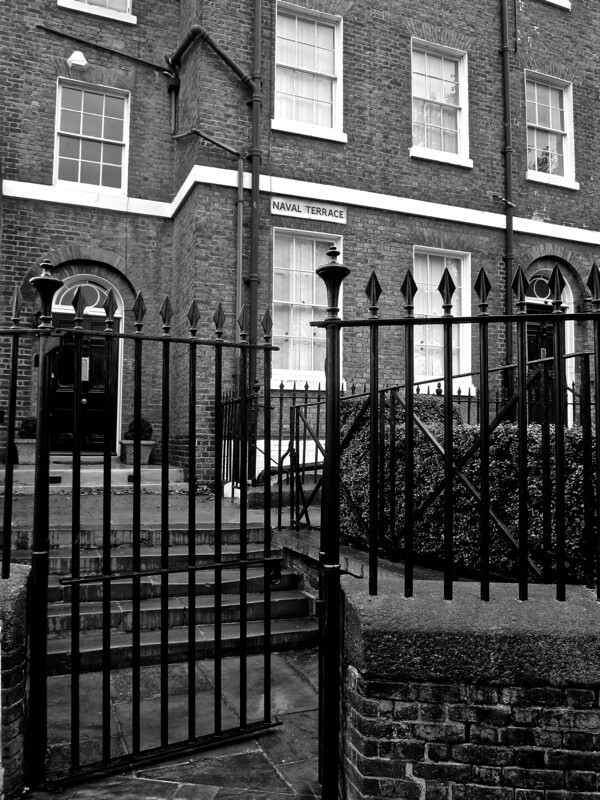 Without this intervention, none of these important buildings would have had a future but, employing the skills honed in saving the old houses in Spitalfields more than thirty years ago, the members of the Trust are able to add them to the long list of over seventy buildings they have rescued since 1977. 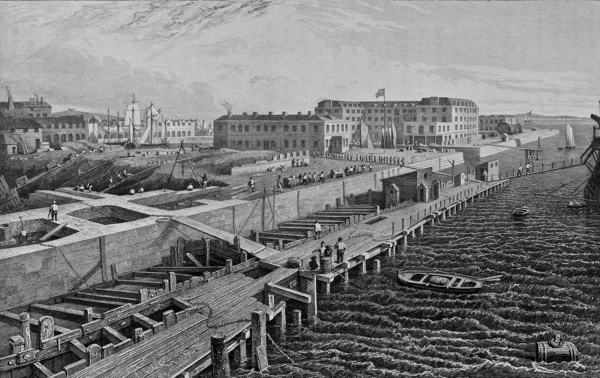 Sheerness Dockyard under construction c.1826. 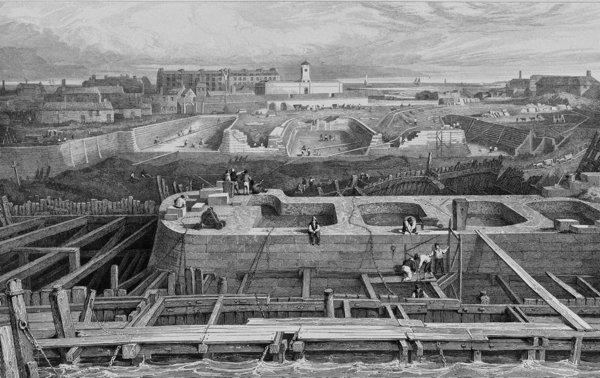 The view looks south and shows the excavation of the Boat Basin in the foreground and the U-shaped Victualling Storehouse in the distance. This building was completed in 1826 to a design by Edward Holl but no longer survives. The Great Basin under construction with the three eastern dry docks taking shape in the distance. 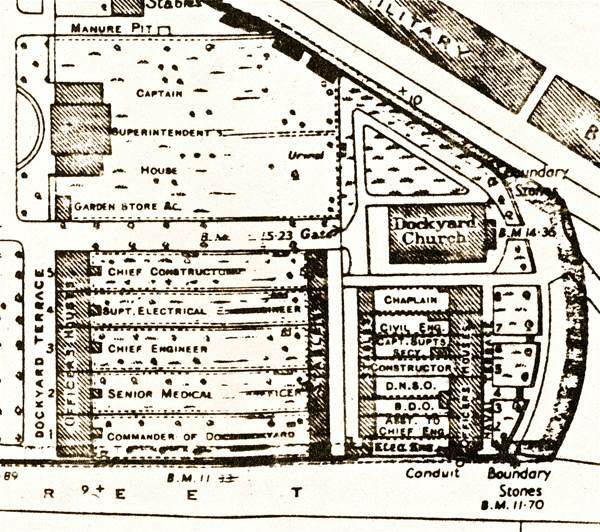 Plan of the residential quarter showing the hierarchy of accommodation and the walled gardens and coach houses which survive at Naval Terrace. The plan is restore the church as a community centre with spaces for small businesses. How fascinating ,what a strange church! and there is a lovely shell beach at the far end of the island, beyond the caravans. Sheppey, well worth a look! 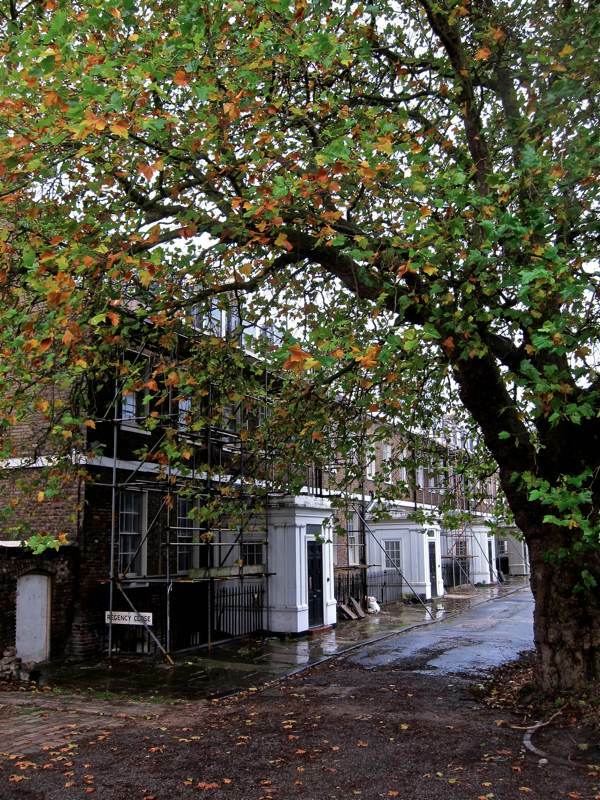 Another wonderful walk – with background info – around Spitalfields without even leaving my armchair. Amazing pics as usual. Thats my exercise for the day. Is this the area, especially the old walls, that have small resident ( “yellow-tailed” / Euscorpius flavicaudis ) scorpions hiding in the crannies? One of my gg-uncles signed on as an officer in the Confederate Navy during the American Civil War, serving on a ship (CSS Rappahannock) that had been bought clandestinely in Sheerness. The boat broke down, put into Calais and was blockaded for the duration of the conflict. The crew had to remain in France or return and face British justice. They never saw America! It’s good to see the town (or part of it) that he had worked in. This is absolutely fascinating, and I love your photographs, as always. My husband was in the Royal Navy and I am planning to take him to Sheerness on the strength of your post. Thank you. I greatly enjoyed this entry, and the wonderful church ruin brought to mind another burned church ruin I visited recently. The Old Sheldon Church South Carolina was a originally a much grander structure than the Dockyard Church, but there is something reminiscent of it in the Sheerness ruin. Following is a link that contains some interesting photographs, though you can imagine nothing captures the magic of standing there along a quiet country road near the Georgia border. I love to see the historical sites and learn about the world my ancestors enjoyed. That is my favorite part of your work. It makes my genealogy research vivid. I have also learned to recognize sites, be able to connect relative locations,and make good guesses at occupations, thanks to you–and all from right here in the Sonoran Desert in Arizona. You are very much appreciated in my little world. I’m glad these beautiful buildings are being saved, but I do wonder who will be able to afford to live in these huge houses once they’re restored. Though it is lovely to see them as they were originally made, at least if they were converted into flats they would be able to house more people and be more affordable…? It seems curious that the Spitalfields Trust doesn’t have a website, it would be great to learn more. I would just like to say that people on the Isle of Sheppey are thrilled that Will Palin and Spitalfields have taken such an interest in the Sheerness Dockyard buildings. 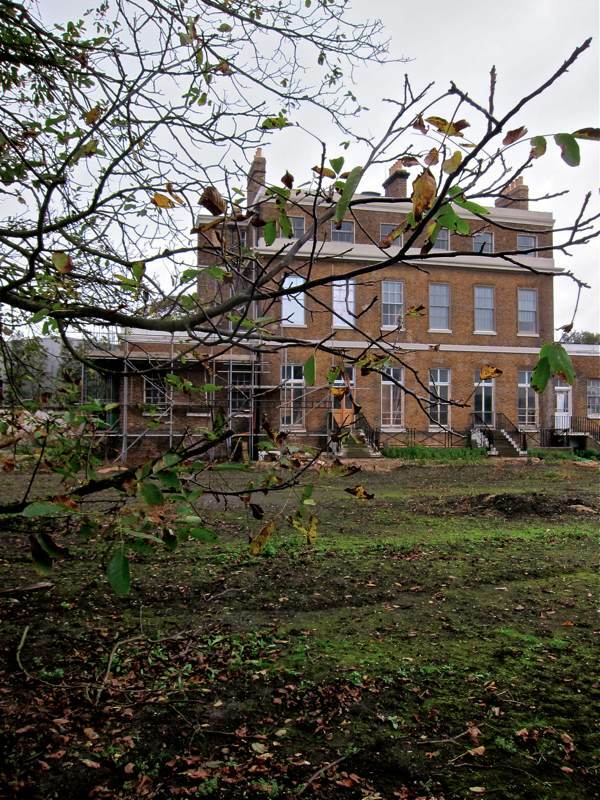 After watching their expertise in restoring Shurland Hall to us, I am totally confident that they will put all their efforts into conserving this part of Sheerness for the foreseeable future. So much of Sheppey’s fabulous history has been allowed to disappear into the mists of time, it’s great to see the possibility of the tide turning. Very applicable for Sheppey an Isle full of Sheep. The head choirboy, John Lewis, Malcolm Brooks, and Geoff Wheatley just name a few! November playing with the conkers from the conkers tree at the back of the church garden, and climbing up into the belfry and seeing the workings of the clock, and of course, the most wonderful spectacle of all the services, Navy, Army, Dockyard workers and so many others, with their banners held over the balcony, and the parade, lead by the choir to the cenotaph! Christmas too was very special starting with the parade through the back gate of the church, [ as seen from the Regency Close view of the church as above] marching along to the Captain’s Superintendent’s house of the Dockyard, where we use to sing carols and then enjoyed the refreshments laid out on his magnificent oak table, ah Happy days indeed! 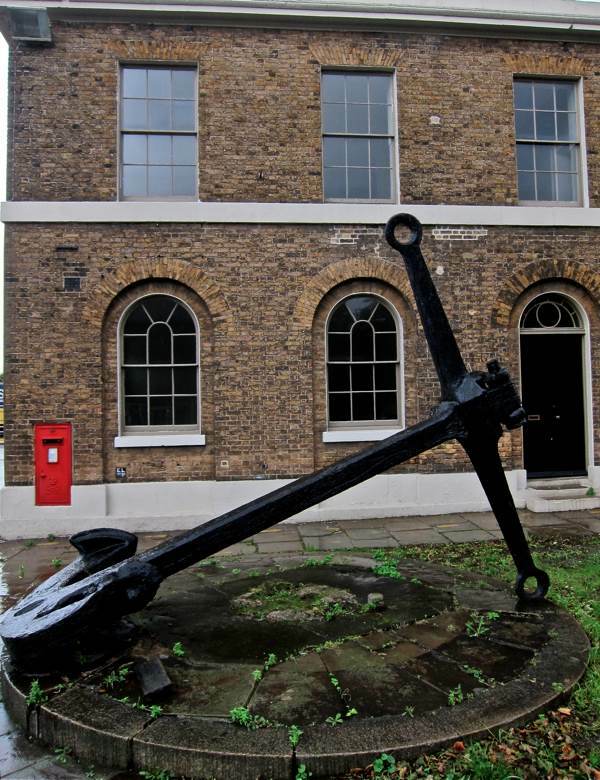 The Blue Town Heritage Centre does monthly tours of the dockyard. 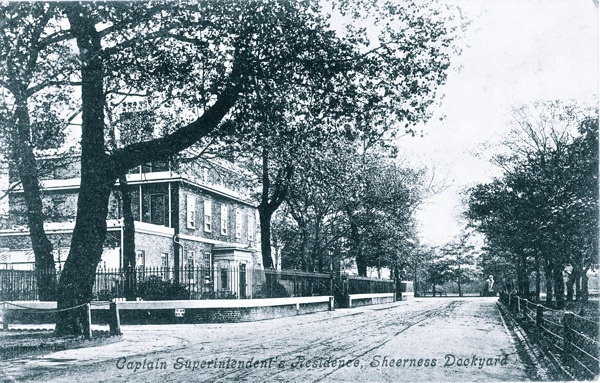 The centre is located in Blue Town High Street south of the dockyard wall. 01795 662981. 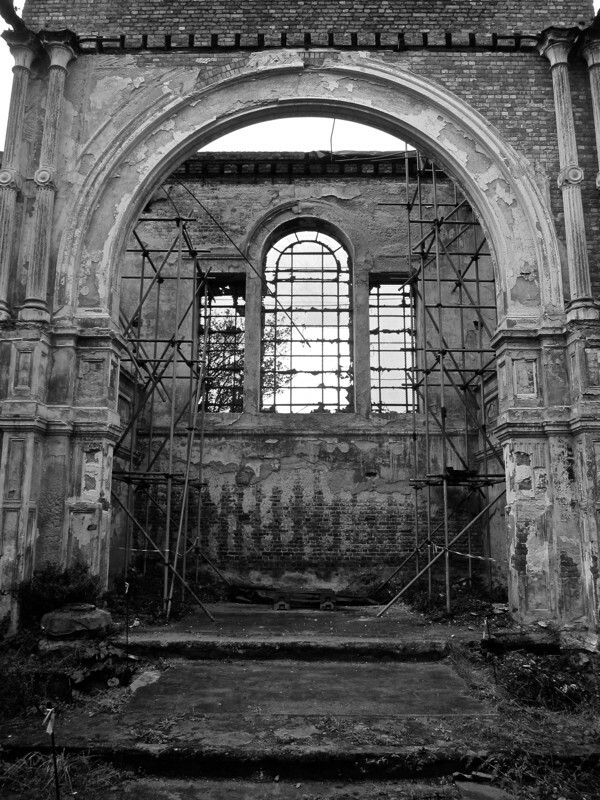 Would be great to see the church restored and rebuilt. My grandfather was in the Navy and he married my Grandmother at the church. When you see the wedding photos and the state of the church now, it saddens the heart. 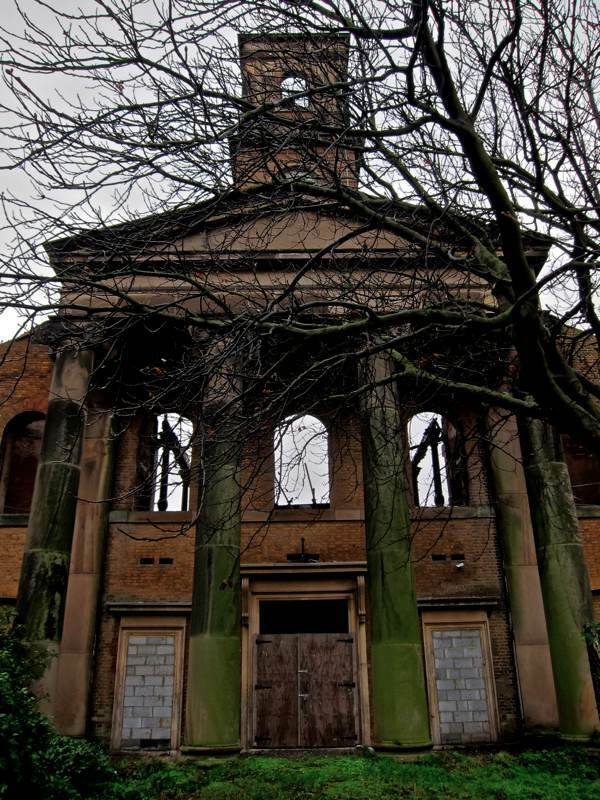 Wonderful news that this lovely old building is to be brought back to life. least of what has been lost through thoughtless destruction. Thank you to all involved in this effortt. I lived in Number 1 Naval Terrace as a child from 1955 until the dockyard closed. My father was in charge of the electrics in the dockyard and although I was only 7 when we left in 1959, I remember much about the house and the church. The house had 16 rooms and was on 4 floors including the basement and the attics. At night-time I used to climb out of my bedroom window and walk along the parapet to my friend’s bedroom, I think in Number 6. My parents never knew! 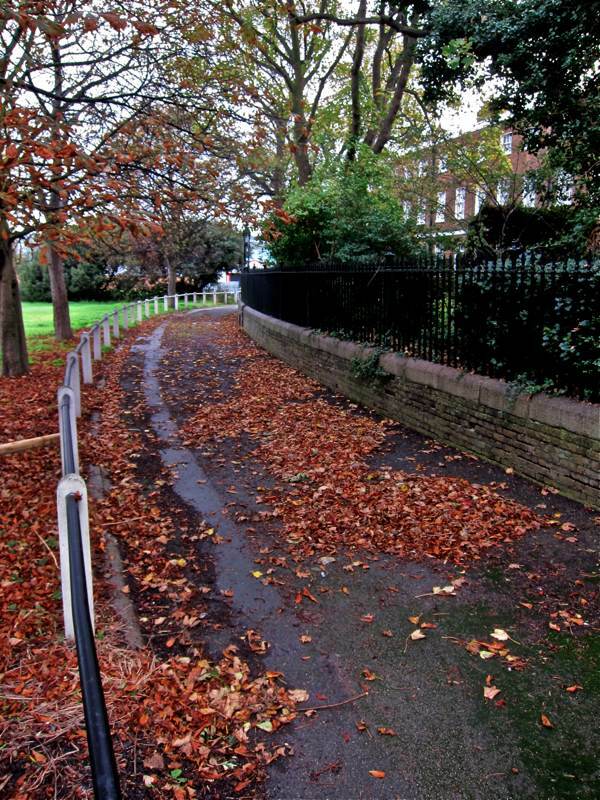 I also remember walking along the wall between the gardens. We used to have lots of drinks parties at that time in the house in our second floor drawing room and my job was to hand around the silver cigarette box. I also remember tricycling around the docks – the wet and dry docks and going with my father down into the bowels of the ships to look at their electrics. At the entry to the docks were figureheads from wooden ships painted in glorious colours. I also remember going to the sea with my grandfather and watching the tide reveal one of the wrecks that was still there from the war. It was like a ghostly ship rising from the sea. We went to church regularly and I think we used to sing “For those in peril on the sea” every Sunday. My sister remembers the iron gates of the church especially well as, whilst playing chase with some boys, one of them pushed back the gate onto her and she lost her two front teeth! I also remember playing in the ground in front of the terrace. There were low brick and concrete bunkers presumably for soldiers to lie on their stomachs with their guns to defend the dockyard. We used to play hide and seek in them. When we lived in Sheerness the road across the marshes was very wiggly and narrow and quite dangerous in the mists. The atmosphere was exactly like that conjured up by Dickens in Great Expectations. We were regularly stopped at the bridge both in the car and on the train because someone had escaped from the prison. Now there is a big main road going from the port to the mainland. 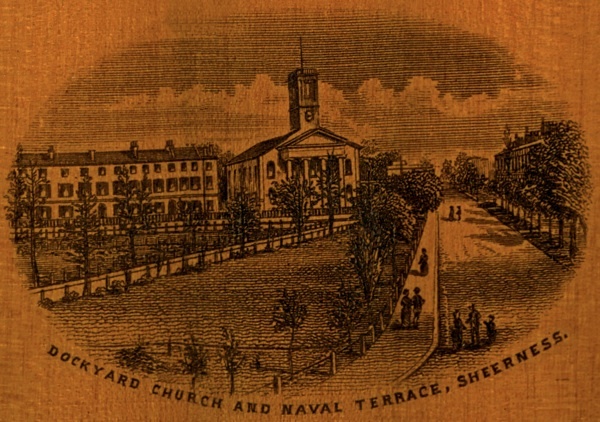 I am delighted that Naval Terrace and the church are to be restored. One day I will go back and see it. I also lived in Number 1 Naval Terrace from 1960 for several years as a child. 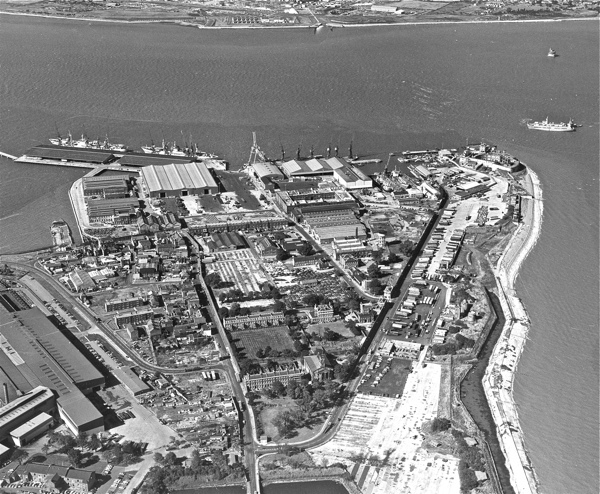 My father, James (Jim) Smith was employed by the commercial enterprise Sheerness Harbour Estate Ltd which bought the Dockyard from the Royal Navy. He was the General Manager until the site was taken over by the Thames and Medway Conservancy Board and was thereafter run by his erstwhile deputy, a Commander Dixon, I seem to recall . Wonderful buildings but unfortunately architectural gems surrounded by an incipient wasteland. Thanks for this. I was a shipwright apprentice and journeyman in ‘The Dockyard’ from 1954 – 1959, and was brought up outside the dockyard wall in Blue Town. After a career in aviation, I returned to Sheerness for the first time in 2012. The devastation of Blue Town and the dockyard was shocking, with the shell of the Church bringing a tear to the eye. They say you should never go back, but your photographs make it entirely possible. Many thanks.